Volvo Premium Certified™ Pre-Owned Trucks are the best quality, best value pre-owned trucks in the industry. These trucks are late model, low-mileage units that undergo our most rigorous inspection and reconditioning processes. Every Volvo Premium Certified™ truck is covered by the Volvo Generation2 six-month, 60,000 mile engine warranty. These trucks are the finest units in inventory, and the best values in the industry. 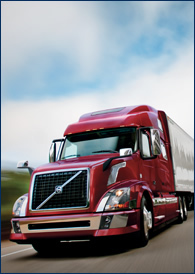 What makes a Volvo Premium Certified™ truck? Class 8 tractors that are five model years old or newer with less than 600,000 miles. Confidence that you’re getting the best, most trust-worthy truck in the industry. This six-month/60,000 mile engine warranty includes turbo and injectors and is backed by NTP, the leader in the used truck warranty business. The multi-point inspection includes a federal DOT inspection and a mandatory pre-certification test drive.